Captivating and cool. The brand new "Indonesia" sneakers are elevator shoes finely handcrafted in Italy. 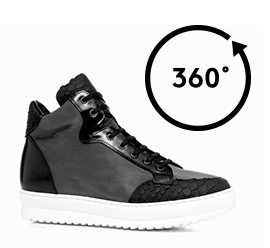 The upper, in black technical fabric and black patent leather, is embellished with details in python skin. The soft inner lining is made of goatskin. The insole in genuine Italian leather. The outsole, of the latest generation, is lightweight rubber. The inner increaser of the "Indonesia" can be chosen between 6cm, 7 cm, 8 cm and 10 cm. Processed according to the traditional craft method made in Italy, the Indonesia sneakers thanks to their comfort, are ideal for long summer evenings with friends and, for their extreme refinement, for the most romantic encounters.